Five hunger strikers protesting the consolidation of staff positions in three UC Berkeley social science departments entered their tenth day of fasting outside California Hall on Friday as meetings between administrators and student representatives had not resolved protesters' demands. The gender and women's studies, African American studies and ethnic studies departments are currently facing staff consolidation through the organizational simplification initiative of Operational Excellence. The initiative plans to reorganize staff members within the departments and cut work hours as part of a restructuring effort to save $500,000 in the Social Sciences Division. About 12 hunger strikers began fasting April 26 and released a joint statement of demands along with their supporters - the Coalition for Gender and Women's Studies, African American Studies and Ethnic Studies and the Ethnic Studies Undergraduate Graduate Front - to Chancellor Robert Birgeneau. The demands included reinstating cut staff positions, ending Operational Excellence, supporting a California legislative resolution advocating for ethnics studies in the state and "publicly (acknowledging) the unfulfilled promise of the creation of a Third World College at UC Berkeley." Junior Veronica Rivas, an ethnic studies and media studies double major participating in the hunger strike, said at a rally Friday afternoon that going without food for 10 days has made studying more difficult but that the strikers have continued attending classes and some professors have given them extensions on their work. "We're not sure how long this will take," she said. "We know that this may not be a success, but it is a stepping stone in a fight that has gone on since before the (19)60s." Since the beginning of the strike, Vice Chancellor for Equity and Inclusion Gibor Basri and Dean of the Division of Social Sciences Carla Hesse have met with two groups of five representatives of the hunger strikers on April 27 and May 3 to discuss the demands. Following the May 3 meeting, however, strikers sent a letter to Birgeneau stating that the administration's consideration of only the last two demands as being the "most feasible" to address was not enough to stop the strike. "To agree to symbolic gestures without solid actions to back up your investment in our departments is to make empty promises," the letter from the strikers stated. "We will continue striking until we see acknowledgement that all four demands which are both well within reach of the UC Berkeley administration and are acted upon in good faith." Basri and Hesse issued a response letter May 4 stating that Hesse had proposed to increase faculty advising and mentorship to students to compensate for the loss of "informal staff support" to students. Hesse also stated that the two faculty members who would serve as advisers would be relieved of one class each to make more time for advising beginning in the fall. The letter also stated that both Basri and Hesse were "happy to express public support" for a California legislative resolution advocating for ethnic studies in the state. However, sophomore and student organizer Marco Amaral said the protesters and hunger strikers consider the letter "unacceptable" and that they would rather keep current staff members in the department than have faculty advisers. "We must stand and fight," Amaral said at Friday's rally. "This cannot end with this hunger strike. This is a beautiful sight - we have shown the administration that we can come together for a common cause. That is our education." The strike has gone "relatively peacefully," and there have been no arrests or citations associated with the protests, UCPD spokesperson Lt. Alex Yao said on Friday. Yao added that to his knowledge, the strikers have complied with campus policy and have not stayed on campus overnight. Campus spokespeople could not be reached for comment Friday. Harvey Dong, an ethnic studies lecturer who took part in the 1969 Third World Liberation Front student movement to establish ethnic studies on the campus, said at Friday's rally that the staff cuts negatively impact the department because part-time staff members cannot carry out their work as effectively. But Dong encouraged students to try to reach an agreement with administrators and end their strike. 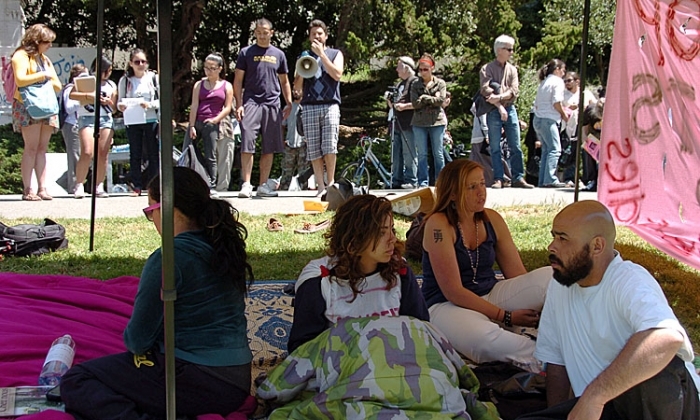 "Personally, I would say to stop the hunger strike, because we need you," he said. "You guys are the moral force on this campus, if there's any morality left at all." Alisha Azevedo is the lead academics and administration reporter.